Our technicians are Certified Pool/Spa Operators (CPO®) and can install, service or replace any pump or filter. Existing pumps can be upgraded to newer energy efficient and eco friendly models – EcoStar and TriStar pumps. 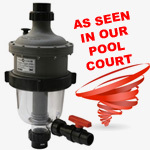 We can re-pack* your sand filter with sand or Zeobrite, or upgrade to a Swim Clear cartridge filter. We repair plumbing leaks both above and below ground. Do you need a refresher course on how your pool operates? The Pool Shoppe can provide a knowledgeable technician to show you how to efficiently maintain your pool. * Filter sand should be changed every 5 – 7 years. Your filter should be backwashed regularly and chemically cleaned once per season.